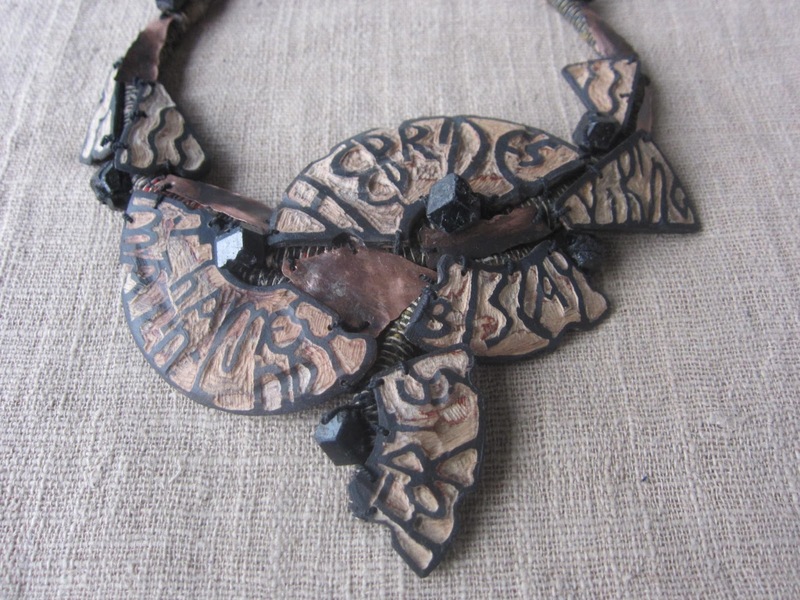 I am a self taught mixed media jeweller. 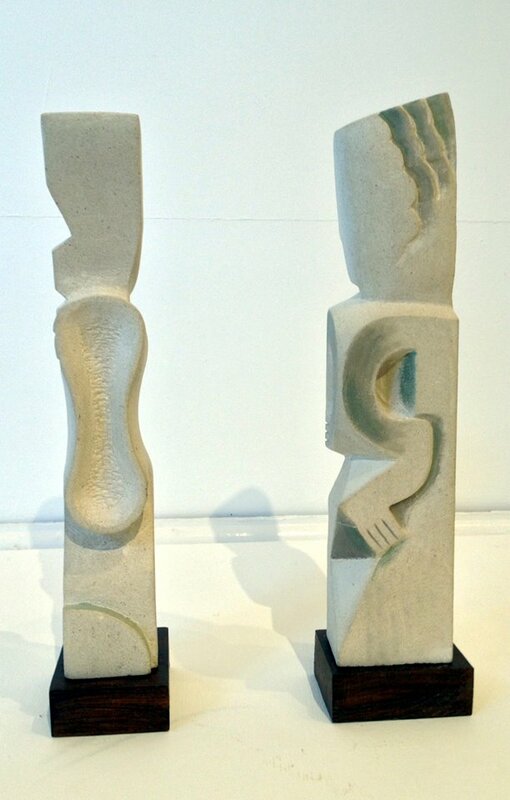 In my work I try to combine materials outside the conventional and expected forms. For me, each piece evokes a sense of place, time or environment. 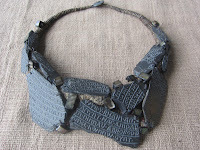 Brought up on the Sussex coast, I have always collected materials, wood, ceramic, sea glass and a variety of found objects. Living now in London, I work & collect in the same way along the banks of the Thames. 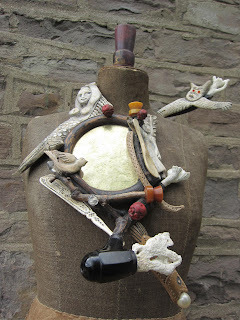 I create bespoke, sculptural necklaces, brooches & bracelets for my clients. 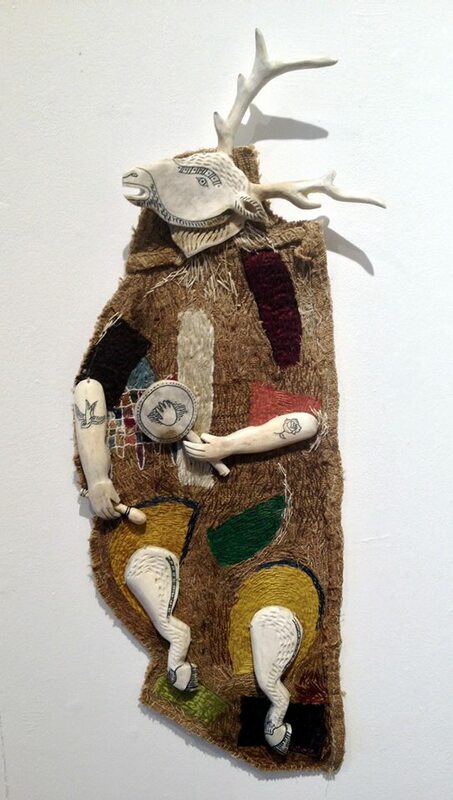 Dancing Shaman, created using scrimshawed shed antler and stitchwork. 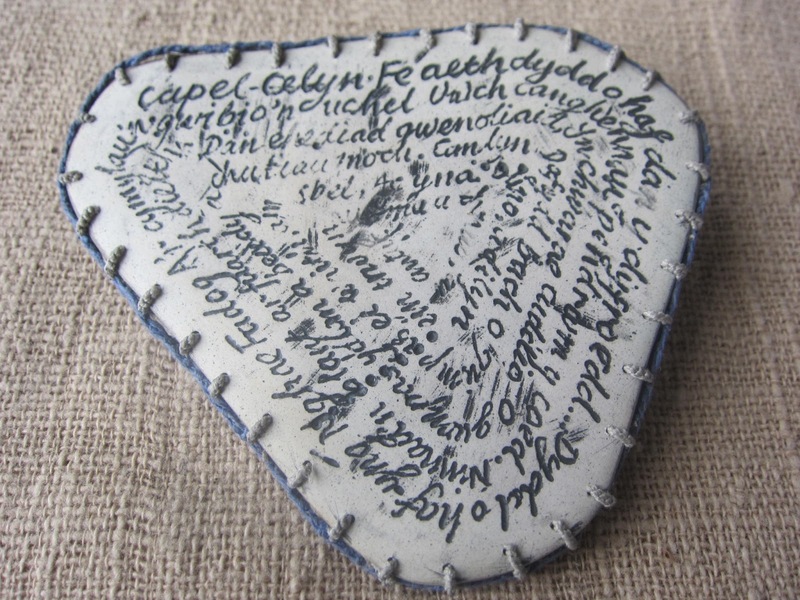 Thames Pottery Brooch With Welsh Poetry. Fabric bracelet with recycled silver engraved with names of wild flowers. 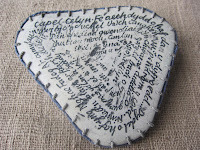 Matt, my husband, has used his skills in lettering and letter design to make sections of lettering that I have incorporated into stitch work bases and fused with different materials.We have attempted to compose an atmosphere of faded writing and old, worn, beautiful textures and colours and our necklaces include Welsh poetry carved into old bobbin sections and recycled beaten silver. The Forming Words show will run until May 17th. The dates are 30th Nov-2nd Dec 2012. Further information can be found on their website. 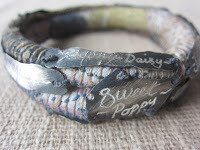 I will be showing a selection of brooches,necklaces and rings. Jewelbook International Annual of Contemporary Jewel Art 12/13. 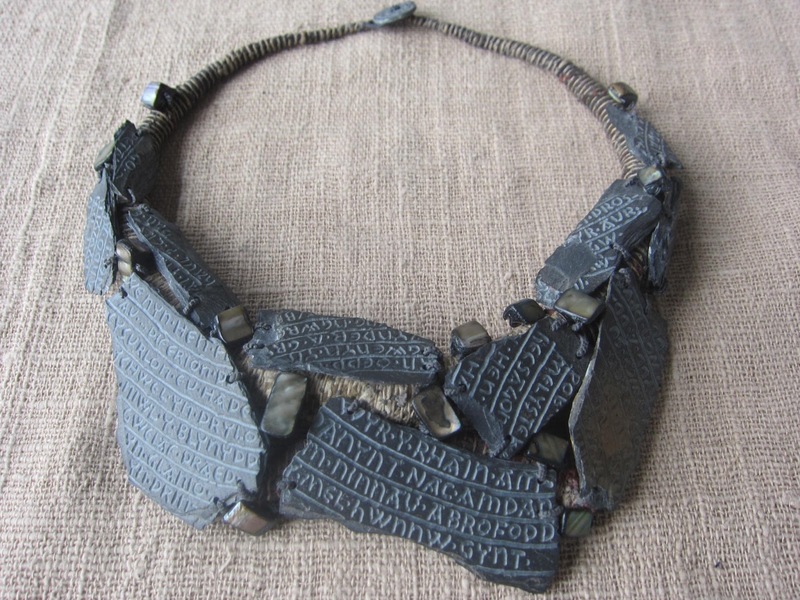 Jewelbook is a unique world wide reference work of 576 pages containing work by 282 selected artists. 35 nationalities were selected,I will have images up soon. 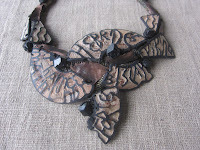 I am just finishing one of three very large necklaces for The Dare to Wear Show,curated by Sue Kreitzman. It promises to be a really exciting show,27 mixed media artists will be exploring profound wardrobe conundrums,will beige kill you,what will you wear to the afterlife? 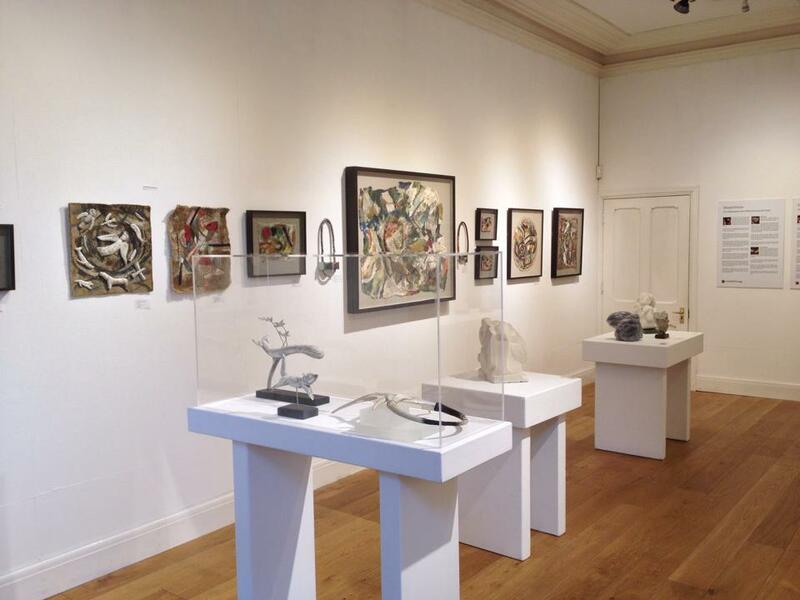 The show promises to be an exuberant riot of art,colour and texture. 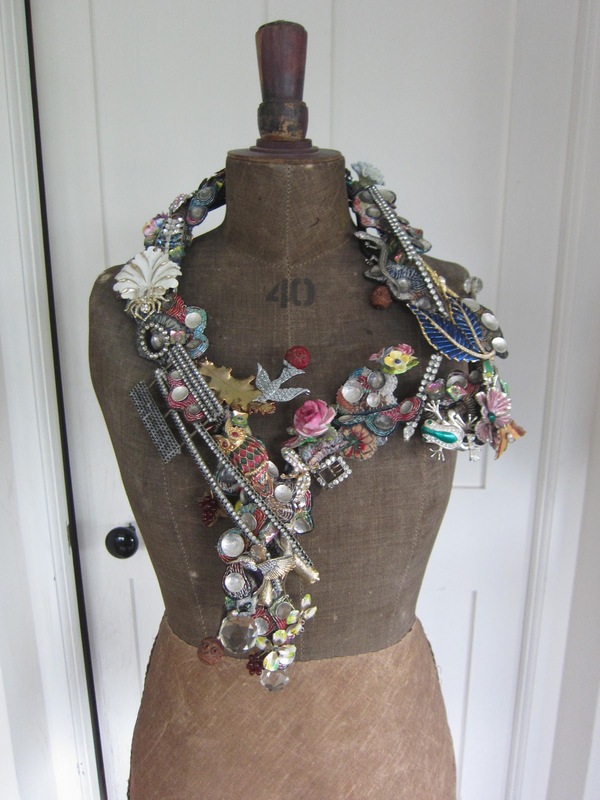 by Sue and are wild!I often have used Tatty Devines pieces in Sues commissions.,Harriet and Rosie creators of Tatty Devine Jewellry have also created a piece for the show,which they told me was delivered yesterday. One of the necklaces I have made for the show,I love the little devil thet peers over the shoulder. Materials used were river bone(very old),shed antler,brass,wood. It was very hard trying to carve the bone pieces,I used my husbands tools and managed to break a lot of drill bits in the process,I have had to work outside as the dust was awful,under Matts guidance though it was fun,but not an experience I care to repeat any time soon! 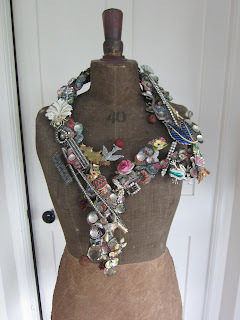 On the right is another necklace in which I used a lot of silver, wood, vintagewww.wildoldwomen.info pieces from my studio and fabric.Both pieces are for sale and actually wearable! 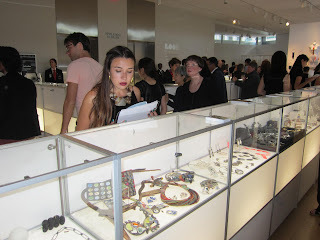 I am not long home from New York,having been invited to take part in LOOT jewelery show. 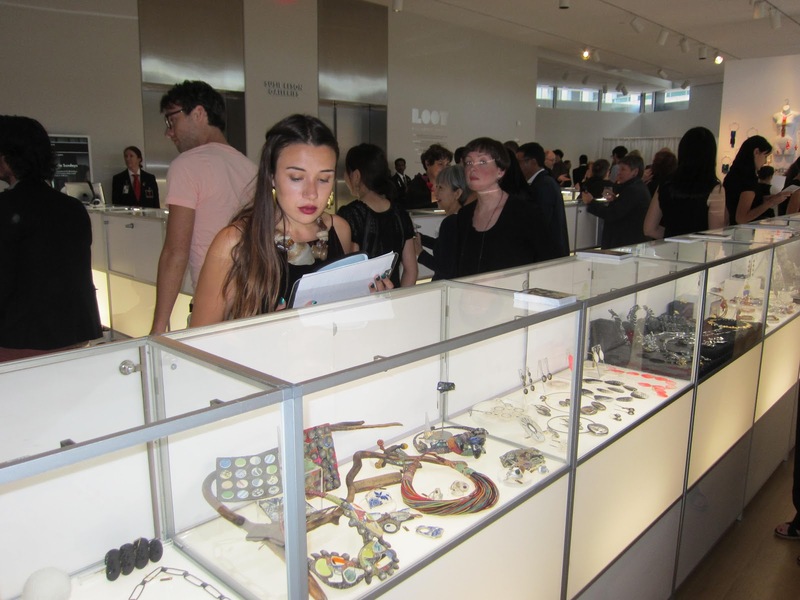 My daughter checking the jewellry before the show opens. I met some wonderful people,a great experience! I am currently completing a collection of boxed art work for for Anthropologie and am very excited about the results so far. As I am moving home,I haven't taken as much work on this year. In terms of shows,I have had two confirmed so far, one of them is Sieraad International Jewellery Show in Holland. This will be the fourth year for me at Sieraad but this year,as a result of many clients requests, my husband Matt and I will be creating a collection together using his skills as a sculptor,we have been trying to realize this idea for some time,so are thrilled to have been given the opportunity. 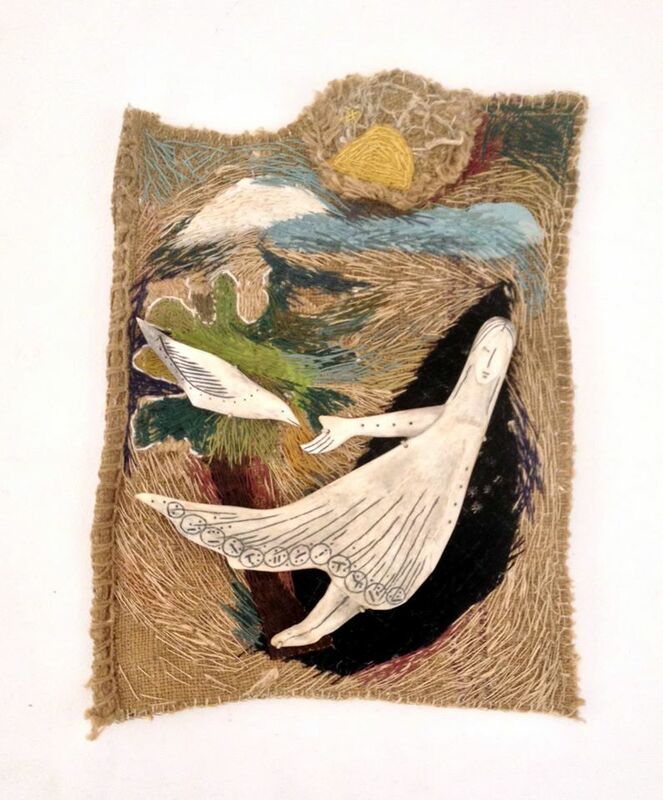 In September,I have been invited to show my work in The Museum Of Art and Design in New York at a show called LOOT.My friends Gilly Langton and Jed Green showed there last year. I hope to have links up soon. I will have dates on these shows soon plus two others that have dates yet to be confirmed. All in all it is turning out to be a busy year,and it's only march! All content © Amanda Caines 2010. Design adaptations by David Caines. Simple theme. Powered by Blogger.